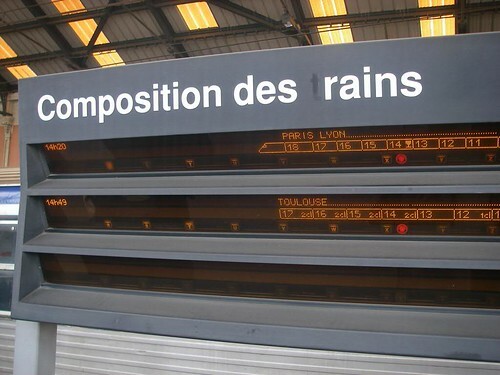 I quite liked the electronic train signs I saw in France last spring. They provided good information on where the train would park on the platform so I could reduce my stress levels by figuring out in advance where I should stand to get on. Nice one. I generally think we are a lot less helpful in the UK. 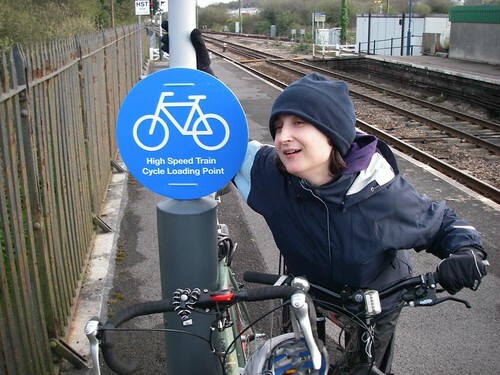 When we took bikes on the train to Cornwall in the spring we stood at the "High Speed Train Loading Point" but of course the train didn't stop there. Only the high speed trains stopped there and there was no way from the timetable to figure out which were the high speed trains! We also use very odd language on our trains. I'm sure this is to confuse foreigners. Train announcers commonly use the word 'Alight' to talk about where one should get off the train - do people know what that means? 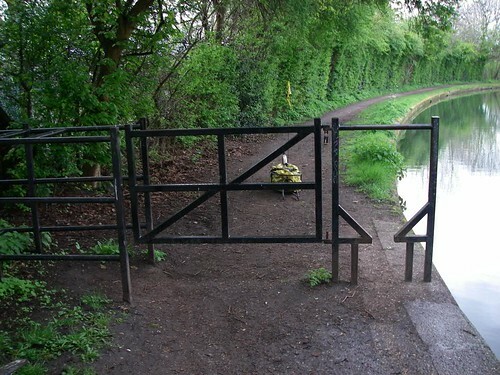 If you ever come to London you can cycle right through town on canal paths. They are awesome but for a couple of obstacles like this one. I would like to see the designer of it negotiate this with my bike and Bob Trailer combo. Here is a photo of the trailer - I had to uncouple it and pick it up to get past this pesky thing. Yes, UK train language is different. We Yanks often wonder what our marital status has to do with purchasing a ticket, when the agent asks, "Single?" I eventually learned that single (UK) = one way (US) and return (UK) = round trip (US).